John 8:12 "I am the light of the world." Began on Feb. 5, 2008. This prayer exercise is given to those in great need. It is also given to those who wish to join in with those in sorrow. This prayer method will help draw us near Christ and help uplift all who participate. On the 5th of each month, for the 5 sorrowful mysteries of Jesus, making the sign of the cross 5 times will join our heart with God's Heart. The 5th of the month and every Friday, Embrace The Cross in honor of our beloved ones, and others will join in as well. It may also be done each month on the day of our loved one’s birthday. This practice is to remind those in need that they are not completely alone; many are Embracing The Cross with them, spiritually and in action of prayer. All those Embracing The Cross are underneath the umbrella of Jesus’ mother. She knows our sorrows and is constantly praying for us. She invites us to join her at the cross of her son; our eyes looking up at his. With a kiss onto his feet. Her veil will softly clothe our sorrows and she will gently whisper, “May you have peace and trust in our Lord.” Her smile will point to the Glory of Jesus. In All walks of Life pray in private or with loved ones. The Power of United Prayer: Matthew ch:18 verses 19-20, "If two of you join your voices on earth to pray, it shall be granted by my Father in heaven. Where two or three are gathered in my name, there am I in their midst." Jesus will comfort you on the 5th of each month. Pray The Divine Mercy prayer card then make the sign of the cross 5 times with a kiss towards or on crucifix or picture of Jesus and photo of your loved one or of anyone of importance to you. Optionally, you may place a night light or light in a cabinet near the photo in honor of that person to remind us of God's Divinity and loving care. May we offer our sorrows and prayers up to Christ. You may also choose to make a cross with your thumb onto your chest or forehead 5 times before your given kiss. Do this prayer exercise on all Fridays, Holidays, special days, or as often as you wish. You may choose to listen to a few uplifting songs after finished. Began Feb. 5, 2008 God Bless. Sorrowful Mysteries: Agony in the garden, The scourging, The Crowning with thorns, The carrying of the cross, The crucifixion. ( Pray for those who lost a child and in womb.) If no photo announce the name or names. Do this prayer exercise for someone who is depressed or far from you. Pray for all our children who are abused in our world and neglected. Uplift them, Oh Lord. Pray for the end of abortion, ending Life. Divine Mercy in song : By Trish Short CD 1-800-462-7426. If you wish to have a small booklet of how to pray the Divine Mercy prayer Chaplet call 1-800-328-9582 leaflet magazine , it will be underneath The Divine Mercy Message and Devotion. If you want a small booklet of how to pray the Holy Rosary, call the same number given, and it will be underneath The Holy Rosary illustrated. During your prayer to Jesus pray for all those Embracing the Cross for many will be praying spiritually with you. May we join Blessed Mary at the cross as she knows our sorrows and is praying for us. Here are the given prayer cards to do Embrace the Cross and Army of Prayer and Rosary. Dear Blessed Mary, Mother of God, all the Angels and Saints, we love you. Be with us and pray for us. We pray for conversion of sinners, conversion of mankind's hearts to turn towards God. Amen. You may do this prayer while making the sign of cross 5 times followed by your given kiss as instructed. God Bless You. Water from the pierced side of Christ, wash me. Dear people in Christ join in spirit from home to home across our world in prayer or rosary every Tuesday, Thursday, at 7:00 p.m. and Saturday, at 2:00 or 3:00 p.m. for 15 minutes. If unable to pray on at these times, pray when you're able. We must ask our Lord, and Blessed Mary, Mother of God , for HELP IN OUR WORLD. This Army for God began March 1, 1994. Place a cross or crucifix in your home, kiss often. This is a great message of strength and hope. Every week, these three days of prayer and rosary will bring forth great power against Satan. Praying from home to home, spiritually and approximately at the same time , will greatly uplift our world. Help spread this message to others. We can rise above anything together hand and hand with God showing us the way help build God's Army. It's time all people pray together. Pray and God Bless. Matthew ch.16 verse 18-19. During the 15 minutes you may read scripture, listen to Christian music, watch a Christian movie etc., or may you offer your prayers up in union with this army. Optionally, you may turn a night light on to remind us of God's light and divinity. May we see Christ’s eyes through all people. Jesus is saying, “What you do unto others you do unto me,” in positive or negative "STAY FOCUS ON ME." God Bless You. This Army began March 1,1994, the month of Blessed Mary's Annunciation, when she conceived Jesus, our Lord. Luke ch: 1 verses 31-32. During the Army of Prayer and Rosary , May we offer our intentions up, for all those who participate in this Army for God. May we ask God to place "Army of Prayer and Rosary", and Embrace the Cross where it needs to go , and where God wants it to go. For those homes Embracing the Cross and practicing God's Army of Prayer and Rosary, your home, offices, churches, military, jails, schools (after school hours to honor separation of church and state), hotels -- wherever your place will be -- is one piece of quilt connected to another place or home that is also a piece of quilt, each sewed together, the threads being beads of the rosary. Whether you're using a rosary, a one decade rosary, a pocket rosary, or your precious fingers, each prayer will keep building the quilted rosary from home to home, place to place, with God's light and his blessings. In praying the Rosary or Divine Mercy Prayer and lifting our prayers up to Jesus, we string a constant thread of hope, peace, and Trust In God. When making the sign of Cross you may say, “In the name of the Father and the son, and Holy Spirit.” It is full armor of God, and clothes us. This is a simple prayer exercise to help reflect on the 5 wounds of Jesus. Begin by making the sign of cross onto your forehead or chest (the letter T). 5 times represents 5 wounds of Jesus. Follow this by kissing the thumb, which represents the crucifix. The 5 wounds, Crowning of thorns, piercing of hands, piercing of feet, piercing of side. Pray for all those Embracing the Cross, for many are Embracing the Cross with you. God Bless You Always. I imagine Blessed Mary to say to us, “My dear ones, when you look up at my son, Jesus, on the cross, smile up to him with love and say thank you and I love you.” It's as if Blessed Mary, our Heavenly Mother, is placing Rose Petals around us, for us to fall back on, and she is lifting us up towards her son so that he may embrace us. Each time we do Embrace the Cross, even in short form, Blessed Mary is with us. She responds to us, and what better way than with heavenly roses. May we ask Blessed Mary to place rose petals around someone who may be depressed, lonely, sick, in suffering, to be lifted up to Jesus and to be given peace and comfort. If you wish to bless someone who is sick, ask God for his peace and comfort to be given, and you may place a cross (letter T) onto the person's forehead, chest, or hands while praying The Divine Mercy Prayer. Dear ones, the shorter method of Embrace the cross is an easy way if you forgot to do the method before the evening ends. Always try to have a sacramental item close to your bedside, such as a crucifix, rosary, pocket rosary, or picture of Jesus. It will always give you strength and comfort. If you wish, you may place a crucifix or rosary underneath your pillow, for it will give you warmth and remind you of Jesus. Make your offering to God -- all your pain, sufferings, worries -- and place them into Christ’s Sacred Heart. To all parents, Embrace The Cross can be taught to your children of all ages. The short way of the prayer method is a good way to begin. It would be a good idea to try to invest in ordering (Jesus of Nazareth) movie by Sir Lew Grade presentation of Franco Zeffirelli production. 376 min. It's an excellent movie that shows Christ’s Birth, Death, and Resurrection. It will help your children know and understand who Jesus, their Savior, is. You can order the movie in the leaflet Missal catalog at 1-800-328-9582 or www.leafletonline.com. Your family will be greatly blessed! My dear Jesus my Lord, I was there when you had to stand alone before the crowd when they were shouting “Crucify him, crucify him,” witnessed by the Roman soldiers and pontius pilate who ordered your crucifixion. Please oh Lord, know that I was with you. When you carried the heavy cross through the streets among the people, please know I was walking beside you and your sorrow with your dear mother, Blessed Mary. When they nailed your hands and feet to the cross, know that the strikes of the hammer onto your Divine hands shattered mine as well. Oh my Lord, Jesus, you looking over the world up on the Cross, saying, “Father forgive them, for they do not know what they are doing". Please know that I was looking up to you, in tremendous love for you, my God, my eyes placed onto yours, knowing you DIED FOR ME and the WHOLE WORLD. When you were breathing your last breath and saying your last words "It is accomplished,” do know that I too was standing at the feet of your cross, in great sorrow with your mother. You heard the cries of the ones who loved you and the pain was so deep to witness such a death. I know you suffered for me and my love for you is neverending. I will always remain at your side, my God, a man. THE KING OF THE JEWS placed on a sign, you were crowned with thorns causing blood to stream down your precious face. Now I see your glory, my personal Savior who had died for our sins and the sins of the world. Your beauty, divinity, joy, and love pouring out into your kingdom. The world looking among your people, your eyes looking at ours. Yours in Christ. It was a warm , bright, and sunny morning. I woke up, put my good clothes on, and headed out the door on my bike. I was asking myself where are you Lord? I want to find you. I kept pedalling my bike, passing church people all dressed up and heading to their churches as well. I knew my destination was a large catholic church called St. Patricks, where I was baptized . I could see the golden leaves falling from the trees and it felt as though God was calling, "Here I am". I finally arrived there looking up at this beautiful church and feeling a little nervous. I walked up the tall steps among other parents with their children at hand. I followed along and stayed towards the back. I quickly took my place in a pew , and putting my hat down next to me. I could see moms, dads, children and elderly ones bending their knee and making the sign of the cross. They began to kneel in prayer, so I too began to kneel. I looked up with my watery eyes for I felt a little out of place and I yearned for my parents to be with me. I could see Jesus , hanging from a large cross on a wall, looking down upon me, "Here I Am". I instantly felt better and not alone. I could see his mother, Blessed Mary, holding baby Jesus, and I felt warmth inside me. Church began and so many important things were happening. The songs were beautiful and I managed to follow along. It was the first time I sang to Jesus. I was falling in love with this place. I didn't understand what everything meant, but I knew it's where Jesus is. After church ended, I could see moms, dads, and children bending and making the sign of cross again. They dipped their hands into water in a beautiful bowl and made the sign of cross. I bent down as well as I left the pew, and I tried to make the sign of cross correctly, dipping my hand in the water as well. The little boy had a long journey just to make it to church, and he knew the church was gifts of importance to God. He found Jesus and wanted to tell others. The story can end in different ways such as, did he have to continue to ride his bike alone to get there? Did his parents awake from their dead selves and see the joy of our Lord? Did the small boy become a leader? Did he become a great father? Did he become a wonderful priest? Our response to our God is our own, God is constantly telling us over and over "Here I Am". The cross tells it all with Mary, looking upon us in prayer for the love of God's people to know Jesus, her Son, her God, and Ours. "Where are you Lord?" comes in this story, along with many other stories of peoples lives. Help build your foundation step by step and receive our Lord and his blessings. Did the boy learn to press on and continue to know our Lord or did He give up and only remembered such a place of our Lord, so beautiful that he wanted to be able to share with others? May we look upon our own lives in asking ourselves, where are we now, what brings us TRUE JOY, where do we see Jesus? My family enters quietly into church, and we are seated in our pew. We begin to silently kneel and pray to our Lord. We could hear this small unusual noise. I looked two rows before us and a man was holding his daughter about five years old. The unusual noise had come from this small child. She had long dark hair, gently pulled up in a ponytail. Her eyes beautifully dark brown, however she is blind. She holds a large beaded necklace and plays with it in her hands. She sometimes will let out a moan, however she is a well-behaved child. As mass begins with everyone standing, the little girl’s father continues to hold her ever so strongly. She sometimes leans on her father's shoulder and you can tell she is listening to what is taking place in mass. She seems to really be at peace with the singing. I noticed she has a few brothers and an older sister. They seem to be very helpful to their father, and try give comfort to their sister as well. When we go forward to receive Christ in the holy Eucharist the father carries his daughter to receive a blessing from the priest. This child has Jesus. She knows she is in the best place in the world, for she is in God's house. She can feel his presence and feel the peace of our Lord. There is no other place she would rather be, for she is with Jesus. Through her father's obedience to our Lord, she is able to receive the gift of blessings God wants her to receive. Although the blindness has kept her from seeing the joy of God's creation, she hasn't been kept from listening and knowing the voice of God. The blessings will continue to flourish and be an out pour from Jesus every time she goes to mass. There is another way of thinking to this story. I don't believe she is completely blind; maybe physically, but not spiritually. She is learning about the wonders of God. She hears God's voice and she feels his unending love, for she is there right in God's holiness. Maybe we should be of concern of our children in our world, especially in USA, of being deprived of ever knowing our Lord. Now we must ask this question, "Who is blind"? We have kept our children from the house of our Lord. We have kept them from seeing the beauty of God's church and the gifts it has to offer. We have kept them from being blessed by a priest. Which child is blind? Is it our children's fault? No! For we all have been blinded. Satan doesn't want us to see this kind of offering our God has for us. He wants us to continue to be blinded with the things of the world. He wants to keep placing his shadow of darkness and hopelessness among us all so we won't yearn for our loving Lord. Our Lord wants all of his children to know and love him to their fullest. People have excuses and excuses but the real word is BLINDNESS. It pleases our Lord when he sees us entering into his holy temple and he hears our uplifting voices when we sing to him, especially the small ones. Oh! He wants to touch his children in so many ways. When we are spiritually connected with Jesus, there is no other joy as great and there is nothing that compares to Jesus. There is no mountain, no gold, no vacation, no sport. When we have Jesus, we have everything we need, for we have his divine love, blessings, understanding, hope, strength, the will to learn more about him. We learn patience, and we see him in other people. We must not get caught up in man’s ways, the ways of society and the distance the world offers. We must reach out to him, for he is constantly reaching out to us. The Lord our savior keeps holding on to us just like the father holding his beautiful daughter, who can't see,and Jesus is asking "DO YOU SEE ME? We receive warning signs given from our towns sirens, to seek shelter, be aware, and watch for tornadoes. The sound of the sirens are so loud that can be heard far out in the county. It makes one feel good that our city cares to warn us, however, on the other hand we take offense of others trying to give us warning signs for our souls. We turn our heads and turn off our ears. Why is that? Maybe because it allows us to look at ourselves and sometimes it's not to great to see or admit. Maybe because it will take some kind of action and effort to try to see what God really is wanting for us. It will take change. We sometimes put God, our Lord Jesus, in such a place off to the side and call on him only when we decide. Our loving Lord keeps waiting and he desires us. He wants us to join our heart to his heart and pay attention to him. We call upon him when a natural disaster is near. We will even warn others. What about calling upon him daily in all our tasks that we must endure and face. We need to keep watch, with our eyes open, for God's signs in our everyday lives. Be wise of who we choose to be with. Are they helping us to gain heaven or are they helping to put us in a place away from our Lord? We have signs. For example when we see gnats flying around rotten potatoes, we respond by throwing them quickly away and only keeping the good ones. When we allow objects, people, negative self pleasures, and choices against God, we are receiving signs of our own souls rotting. Where is our courage to see the effects on our soul? We respond quickly to things that are naturally decaying, but when our souls decay we don't respond. We don't hear or see God’s warning signs and we miss the given siren. We decide to place God to the side and call on him on our time instead of his time. Our Lord always has a loving hand upon us and is not harsh. He waits patiently for our response. He wants to mold us uniquely to himself so we can give ourselves back to the world. What are some of the warning signs in our daily lives? What we choose to see on TV, the internet, magazines, pictures, and the music we choose to listen to. How we react towards others, especially in front of our children. How we speak to our spouse and our children, the ones we love. The list can go on and on. These are warning signs we encounter daily and what is the siren? The Bible. Who is blowing the sirens? Our priests, ministers, deacons, teachers, parents, and people who gently keeps reminding us of God's way, not our own way. Our Lord loves us in our weaknesses and faults. He wants to pour forth his love and graces he has to give out to us. He desires us. When we respond to him with all our heart and soul, he gently picks us up, grasps hold of us, and God is pleased. That's the best sign. The doors open, lights turned on, this place is made comfortable to begin a new day. Hi! I don't have a name yet, however I must tell you that I've entered into this world. It's my new beginning. It's warm and secure for me. They call it a womb. Wow! I am growing inside a womb of my own mother. I wonder what I will become in this enormous, and beautiful place they call earth? My mother, enters inside this building and I wonder, is this my new day? Will I see her? I hope she is pleased with me. I can't wait until her eyes meet my eyes. Suddenly I hear sounds, I believe voices and I'm still thinking about my mom, and our new beginning. Oh Mama! What is happening? I'm feeling torn apart, oh with so much pain! Will you hold me when this is over? Darkness has come over me and I have no one to help me. Oh Mama! If you can only hold my hand, I believe I will be better. Please make this pain of darkness go away. I look down on earth upon my mother and tears are flowing down her precious face. My body parts are placed inside this plastic bag and I believe a number of some sort was written and I could see that I was tossed aside with other bags and they had their own numbers as well. My Jesus allowed me to view the rest of the day. There were more women with tears and more body parts being taken away, to be closed up inside bags with a number. It was towards the end of the day, and I could see plastic bags of all the body parts being thrown into a large dumpster, and I too was among them. I could see the lights turned off and doors closed, only to begin another New Day. Please! My dear reader, remember always, it was my Last Day. Psalm 139:13 "Truly you have formed my inmost being. You knit me in my mother's womb." My Son, THIRST for you. Oh, my children who are precious in the eyes of my son, Jesus. You are jewels and crystals in his eyes of love. You are made in his own likeness and image. Each of you are of great importance and uniqueness. He knows each of you and is constantly at your side. Give thanks to your Lord for all the given joys you receive. In your difficulties, or when life seems dull or even empty, offer it up to him and he will place it all into his SACRED HEART. When he gives you a cross of your own to carry, don't toss it away. Instead, face it and pick it up as he did, and he will help you carry it. Remember, my son had help carrying his cross from Simon of Cyrene, and he fell two more times thereafter. It's a reminder to you that when we fall we keep striving to go forward in the richness of Jesus. How many of you have lost your child only for a few moments and total fear fell upon you? I lost my son, Jesus, for three days, and finally found him "In the Temple". I wanted to shout and scream, however, I was grateful to have found him. That was an example, as young as he was, of how important it was to be in the temple to listen to scripture, and the importance of the leadership he learned from. In turn he began teaching them, or at least all who were willing to listen. When my son sees his people entering into the temple, his sacred heart burns with so much love and his passion pours out to each of you. When children are placed carefully in the pews the heavenly court, meaning the angels, saints, and myself, lift ourselves up in union with all of you in my son’s glory. When each of you are seated and participate passionately in mass or service my veil is placed across each of you and I bless you. I see young, old, the single, many families, and some are of joy and some of sorrow. I place all of you underneath my umbrella and lift you up to my eternal son. With communion, his body and his blood is raised up by the priest, all of you are blessed in a special way along with the Heavenly Angels. If you receive Jesus physically or spiritually in the blessed host body and his blood, you receive graces personally given each time you are present. I am your heavenly mother, and he is my heavenly son, my Lord, whom has been brought to the world for our joys, sorrows, and glory. He won victory on the cross and salvation was given to the world of ALL NATIONS. What if you were on a side walk near a large catholic church, and suddenly you met this beautiful woman, and you instantly knew she was unique and not of this world. She will speak and say, “good morning, my child, would you like to visit my son?” You look at her with awesome wonder and you answer her, “who is he?” She takes you gently by the hand, enters church, and blesses herself with holy water in making the sign of the cross. You follow her, she leads you quietly to the front, looking at the altar, she looks deeply into your eyes and says, “he is here my child.” You answer her, “where? I can't see him!” She bends down, kneeling in prayer, you kneel beside her and she says, “BE STILL HE IS PRESENT IN THE TABERNACLE. He is placed on every altar at every mass.” She looks at you again and she says be still and you will feel his presence, here in this place. In your silence, you will see and know him. Pray to him and he will bless you. She looks upon you and says "I am his first tabernacle, his holiness was placed in my womb". Pray with honor, joy, and devoutly for it is where you will find true peace from heaven. My son was born and he redeemed the world. When you come here and kneel before this altar, my son blesses you and he is most pleased. He knows you and he smiles gently towards you and replies, "Thank you for your visit, I will remember you for doing so. Visit me often and my holy spirit will dwell among you. My pure love will flow over you, each time you bend your knee or gently place yourself in the pew, I see you, BE SILENT and you will hear me today and always". May you try to visit Christ in the tabernacle whenever available during the day, evening, before, or after mass. His TRUE PRESENCE is in every tabernacle, and his divinity of light will be among you and remain with you. God Bless You Always. Mass is the most powerful prayer instituted by God. John: ch. 6 shows Divinity and power in the holy sacrament of the Eucharist, Jesus’ Body, His Blood, His Soul, and His Divinity. Mass is the closest to Christ’s crucifixion; many graces flow out upon his people at every Mass. Mass is the Holy Sacrifice Christ gave to his disciples, to be given to all people through the Holy Orders of our Priest. When you receive the Holy Eucharist, give a thanksgiving to our loving God, every time you receive Him, and offer all your prayers up to Him. Those who can only receive Christ spiritually in the Holy Sacrament of the Eucharist, you can do the same. In Mass we are All in Union with Blessed Mary, All the Angels, and Saints, and All the people around the world. THE LAST SUPPER was the first consecrated Bread and Wine changing into Jesus’ Body and Blood. Through this sacrifice Jesus instituted and wanted all to partake of His Body and Blood, we are united with His Holy Cross on Calvary. Priests are Successors of the Disciples of Jesus through the power of the Holy Spirit. This great gift is given for those who believe in Jesus, and His own words given in John ch.6. We as a people are to bring Christ to the world and the world to Christ. To All People! Every time we go the church, we become one in Christ. Renew ourselves and dwell in God, always. Our Father, who art in heaven , hallowed be thy name, thy kingdom come, thy will be done on earth as it is in heaven. Give us this day our daily bread and forgive us our trespasses as we forgive those who trespass against us, and lead us not into temptation but deliver us from evil. For thou is the kingdom, the power, and the glory are yours now and forever. Amen. Hail Mary, full of grace the Lord is with thee, blessed art thou among women and blessed is the fruit of thy womb Jesus, Holy Mary, Mother of God, pray for us sinners now and at the hour of our death. Amen. (Luke ch.1 verses 28-42) Hail means “to good health”. We ask Blessed Mary our heavenly Mother to pray for us, just as we would ask our own mother to pray for us or any other person, however she is Jesus’ mother. God, I know you will call me for special work in my life. Help me to follow Jesus each day and be ready to answer your CALL. We are blessed always when we wear a cross, crucifix, Blessed Mary, Saint, Angel etc., medal or bracelet, ring, pin, or a key chain, something to show and remind us that we are Christians, a follower of Christ. If we can ask our US Army to defend us, then why can't we ask St.Michael, who was given permission to cast Satan into Hell with one third of his followers ? Hail Holy Queen, mother of mercy, hail our life, our sweetness, and our hope, to thee do we cry poor banished children of Eve. To thee do we send up our sighs mourning and weeping in this valley of tears. Turn then most gracious advocate thine eyes of mercy towards us and after this our exile, show unto us the blessed fruit of thy womb Jesus, O' clement O' loving O' sweet Virgin Mary. pray for us Oh Holy Mother of God, that we may be worthy of the promises of Christ. Amen. This prayer is to be prayed after the Holy Rosary is completed or prayed any time, even in song! This is the most beautiful prayer that can be sung to Blessed Mary. If you wish, you can make up your own music in singing this prayer, many graces will be sent to you. Furthermore, ALL the given prayers on the Embrace the Cross site, can be sung! Remember, Hail means “to good health”. When we sing in prayer or pray in asking Blessed Mary to pray for us, it's the same as asking our loved ones to pray for us. Remember always Blessed Mary is Holy Mother of God, and we ask her to pray for us. She is already in Heaven, near Her Son, our Lord, and remains at His side. She is with all the Angels and Saints in all of God's Heavenly Glory of Praise! We are only asking for Her intercession to God, for she is the closest one to Him. Jesus was born in her womb and She is Holy. She was at the feet of her son's cross, and Jesus was placed into her precious arms of grace. Her Heart and Soul was pierced. I am the Lord your God, you shall not have any strange Gods before me. Meaning: Do not worship another person, or object. Do not place sports, people, money, or objects before me. You shall not take the name of the Lord, your God in vain. Meaning: Do not use God as a slang word or in using it as a bad word in any way. Always use God’s name with honor and respect. Meaning: If able, go to Service or Mass every Sunday unless due to sickness, weather, emergency,etc. The Sabbath begins on Saturday evening and follows into Sunday evening. Saturday vigil mass counts for the Lords Day. Meaning: You must speak to them with dignity and respect at all times. You must respond to their instructions in task and what they ask of you. As they get older treat them with love and honor always. Meaning: murdering another person , ending life through abortion is killing, killing another person's spirit through abuse (verbally, physically, emotionally) is destroying that person. Abusing your own body physically with substances that damage your body given to you by God. Seek out help from a priest, minister,or physician. Be careful of what music you listen to for you can damage your spirit as well and what you place your eyes on in watching movies and videos. Meaning: Going outside of your marriage with another person. Looking at another person in a photo, magazine, or internet in such a way that is against God. Speaking to another person in an immoral fashion or conversation is a form of adultery. Meaning: Taking what is not yours. Also not giving your children God, in a way, is keeping them from ever knowing Him. Cheating on insurance claims is stealing. Giving false information for your own gain. Meaning: Putting others down, gossiping about them, spreading rumors. Also speaking badly about another’s church or belief and saying false things about that church is against God. Meaning: Looking at another person's wife or husband in such a way that is against God. Engaging with another person's spouse in an unmannered way on the internet, phone, etc. is against this commandment. Meaning: Having something that doesn't belong to you and you will not give it back. Having possession of something knowingly that it is to go to another is against God. Baptism: Cleanses us from original sin, makes us Christians. Baptism of Jesus (Matthew ch3: verses 13-17) You can be baptized in water, blood for martyrdom for God, or desire meaning: you really wanted to be baptized however you died before you ever got the chance to. Penance: Sins committed after baptism are forgiven. ( John ch.20 verses 19-25) through confession or reconciliation. Christ, himself gave the Disciples the power to forgive and absolve sins, the night of Easter Sunday! Priest are successors of the twelve Disciples. Penance or reconciliation is a beautiful sacrament given to us by God. Matrimony: Unites a Christian man and woman in lawful marriage. A couple becomes one with Christ. Holy Orders: Bishops, priest, and other ministers of the church are ordained and receive the power and grace to perform their sacred duties. Luke ch. 6 verses 12-20 "Choice of the Twelve"/ Apostles (Disciples) the names of these Brave Men of Holiness of God. Our Priest and Bishops, are their successors. Anointing of the sick: Through the anointing and prayer of the priest gives health and strength to the soul, and sometimes to the body, when we are in danger of death from sickness. "It is therefore a holy and wholesome thought to pray for the dead, that they may be loosed from sins." Jesus speaking to St. Peter, calling him the "Rock" of his church. The Assumption of Blessed Mary, woman clothed with the sun, and moon under her feet. Speaks about how a woman should be in Christ eye's. The women at the tomb of Jesus. I prepared a place for you. Whatever you ask the Father, he will give you in my name. We as Christians need to be able to show others that we are Christians, followers of God. May we wear a necklace of a Cross or Crucifix, a medal of Blessed Mary, a Saint, an Angel or a bracelet, even a key chain. It will keep us close to God and remind us of our actions and words towards others, as well as our conversations. If you have a "Pocket Rosary " you may place it on a key chain and pray with it on your lunch break, waiting on a doctor's appointment, etc. If you have a one decade rosary, take it to work to pray a decade or more of the Rosary or Divine Mercy. All these things will keep you underneath God and you will receive many blessings. Also, those who wish to listen to "The Stations of the Cross" of Jesus by Dana as well in CD. If you want to listen to uplifting music order from same number at 1-800-328-9582 of John Michael Talbot "The Ultimate Collection" 2 CDs. Check online A Christian Group called, The Thirsting their CDs Companions of the Lamb, or Universal Youth, at www.thethirstingcatholic.com type in the song "Ocean of Mercy" or "I Thirst", or "Once is a Life Time". I believe you will love and adore them. For booking The Thirsting at your church , youth group, etc. contact Daniel Oberreuter at 360-521-7961. Enjoy, be uplifted, get moving in inspiration towards Jesus! Jesus is our shepherd and he is holding each of us onto his shoulders, he knows us by our name, and will never let go. Luke ch: 15 verses 1-10 mentions a lost sheep that is found and is rejoiced that it is found. It also says, “I tell you, there will be the same kind of joy before the angels of God over one repentant sinner." To my reader, Our loving Lord will rejoice over you each time you humbly go to him and join your heart to His Sacred Heart of Glory! Try to pray on 3:00 p.m. hour when Christ died on the cross or pray when you're able to. Many graces will flow unto your soul. In the Holy Rosary we ponder the life of Jesus through the eyes of his mother. Make the sign of the cross and kiss the crucifix and also make your offering of those and what you want prayed for. Make the sign of the Cross with the crucifix of the rosary. On the 1st bead from the crucifix, say one "Our Father"
On the 2nd, 3rd, and 4th beads, say the "Hail Mary". Say one "Glory Be to the Father". On the large bead before each decade (meaning 10 beads) , say one "Our Father". Say ten "Hail Marys", (one for each small bead of the decade) while meditating on the Mystery. Say the "Glory Be to the Father". Say the following prayer requested by the Blessed Virgin Mary of Fatima: "O my Jesus, forgive us our sins, save us from the fires of hell. Lead all souls to Heaven, especially those in most need of Your mercy"
Say the "Hail Holy Queen". Oh my Jesus, forgive us our sins, save us from the fires of Hell and lead all souls to Heaven, especially those most in need of thy mercy. Hail Holy Queen, Mother of mercy, hail our life, our sweetness, and our hope, to thee do we cry poor banished children of Eve to thee do we send up our sighs mourning and weeping in this valley of tears. Turn then most gracious advocate thine eyes of mercy towards us and after this our exile, show unto us the blessed fruit of thy womb Jesus. O' clement O' loving O' sweet Virgin Mary, pray for us oh Holy Mother of God, that we may be made worthy of the promises of Christ. Pray this after you've completed the Holy Rosary. (All 5 decades). The Joyful Mysteries: To be said on all Mondays, and Sundays of Advent. The Annunciation: Mary learns from Angel Gabriel that God wishes her to be the mother of God, and she humbly accepts. Luke ch:1 verses 28-31 Luke ch 1 verses 46-55 "Mary's Canticle" Her response of the Angels message in saying "Yes". The Presentation: Mary and Joseph present Jesus to His Heavenly Father in the Temple of Jerusalem for forty days after his birth. Luke ch: 2 verse 22 Simeon says to Blessed Mary "And a sword will pierce your own soul to". The Sorrowful Mysteries: Are to be said on all Tuesdays, Fridays, and Sundays of Lent. The Glorious Mysteries : Are to be said on all Sundays (except during advent and lent) and all Wednesdays and Saturdays. The Luminous Mysteries: Are to be prayed on all Thursdays. Eucharist means “thanksgiving”. It's The Body, Blood, Soul, and Divinity of our Lord in appearance of Bread and Wine. The Priest consecrates the Bread and Wine, changing it into the real presence of God, through the power of the Holy Spirit. John ch:6. What if Blessed Mary allowed you to hold her son, Jesus, as a toddler. She gently places him into your arms with his bare skin and only a diaper on. You're in awe for you know you are holding God. You touch his soft curly hair. Blessed Mary placed her trust in you to care for her son. Jesus begins to sing! His voice is so beautiful, none like you've ever heard before, and you automatically know he is very intelligent. Suddenly you are no longer holding Jesus, instead you see him sitting in a high chair only viewing the back side of him. You see a crown of thorns on his precious head. Jesus is in agony and pain. Next thing you know, Jesus turns into a little old man, such as a homeless person. He lets himself out the door and you sadly wave good-bye, for now you are worried about him, in wondering how will he be treated by others. Once he was a beautiful child who could sing with joy, and he was very loved. How will others see him for they don't know him and all his great beauty. When we hold a child we are embracing Jesus, and he trust us with His children, whom he created. Jesus knows each of us by our own name. When we look into their eyes we see Jesus’ eyes, and how are we going to treat that child? Are we going to show them kindness, love, and patience? Are we going to teach them to sing? When they grow up are they going to be able to show God to others? When we care for another person, we are taking care of Jesus, for we are all made in his likeness and Image. Jesus said "Whatsoever you do to the least of my brother, that you do unto me", in positive or negative. Oh World! How are we treating the lonely, bullied, homeless, depressed? Remember always that those in neglect once was a beautiful child who could dance and sing. God is asking us can we, as a people, find the beauty within them? God Bless Always. A simple story: I have time to myself today! I think I will stop at a church nearby and simply pray. I quietly allow myself in and sit towards the back of the church. I look over to my right and I see a man sitting alone in prayer. I prayed some prayers, blessed myself with holy water, and left the church. Several days later I returned back at church again, I knelt in prayer, offering up my prayers to God, and those I want prayed for. I looked over to my right side, and I could see this same man sitting quietly with his head bent down, and He was dressed in a cloak that was sparkly, and glowing. A few days passed by and I went to church again. I began to kneel in prayer, however I remembered the man in the luminous cloak that I had seen during the last visit. I was wondering who was he and where was he from? Suddenly, that same man sits beside me with the cloak of splendor. He gently places his hand onto mine and calls me by my name saying, "I am your God, I love you, and I am with you now and forever." I look down at his hands still remaining onto mine, and I notice the markings on his hands. I place my hands onto his precious marked hands and he replies"I did this for you." He quoted me a scripture of John ch:6 verse 56 and he was gone. I realized that this man was Jesus. John ch. :6 verse 56 (The man who feeds on my flesh and drinks my blood remains in me, and I in him). Every time the Bread and Wine is consecrated by the priest, in changing it into Christ’s body and his blood and he raises Jesus above the altar, EVERYONE is blessed at mass, even those who are unable to receive him physically, but spiritually. When the host (bread), and chalice (blood) is raised up and the bells ring during the consecration, may we offer our own pains, sorrows, worries, and even our joys, up to God. Remember always, the Holy Eucharist is the closest to Christ’s crucifixion. The crucifix is a bloody sacrifice, and the Eucharist or Communion is an unbloody sacrifice. Jesus wants everyone to participate in Mass, in singing the songs, listening to His Words in Scripture, praying the prayers, becoming one in His Mystical Body, making the cross on our forehead, mouth, and chest (meaning, having Christ in our minds, on our lips in the way we speak, and in our hearts). During the “Holy, Holy, Holy” prayer we ask the heavenly Angels to join us! How exciting is that? We participate in making the sign of the cross in entering and leaving Mass, blessing ourselves with Holy Water, and genuflect before we enter the pew and after. ALL of these things are GIFTS OF GOD. No matter what our situation may be Christ is longing for our participation and along with our Guardian Angel as well, and with all the Angel's and Saint's. Remember, Christ will meet us any time, anywhere, and when we are ready to meet him. If you wish to bring someone with you to church, then you will be extra Blessed. Christ works through His church. His Priest, His People, are ready to help us in anyway they can. Be firm, and take courage, YOU WILL KNOW AND SEE JESUS! Jesus wants us to take him everywhere we go. He is interested in our every need and wants to be apart of our lives. When we visit him at church, and we pray our prayers given to us, making our offerings to him, He meets us there. He places his precious, marked hands onto our shoulders, calls our name, and gently says "remain in me and I in you." We are to love Jesus, and love like Jesus. We are to be imitators of Jesus, even in our own difficulties and trials. The church is open everyday for anyone to visit our Lord in a peaceful and quiet setting of holiness. If you are uncertain about stopping in but wanting to simply sit, kneel, or pray, you may contact the parish office before you make plans for your visit, and Jesus will be there! The church is for anyone, and anybody who wants to find and feel Jesus in a special way. May you look at Embrace The Cross as if Blessed Mary is placing rose petals all around you for you to fall back upon, she remains at your side to comfort you, and she gently helps lift you up towards her precious son, for HIM TO EMBRACE YOU. “No one lights a lamp, and puts it under a bushel basket or under a bed, He puts it on a lamp stand so that whoever comes in can see it.” Luke ch: 8 verses 16-18. To all people: Keep God's light shining forth! When we enter into our beautiful churches, you will discover a sense of peace and comfort. You will smell fragrances of candles, incense, and flowers. When you are in your pews, look around and you will see the "Fourteen Stations of the Cross". Observe and notice the markings of Christ at each station. 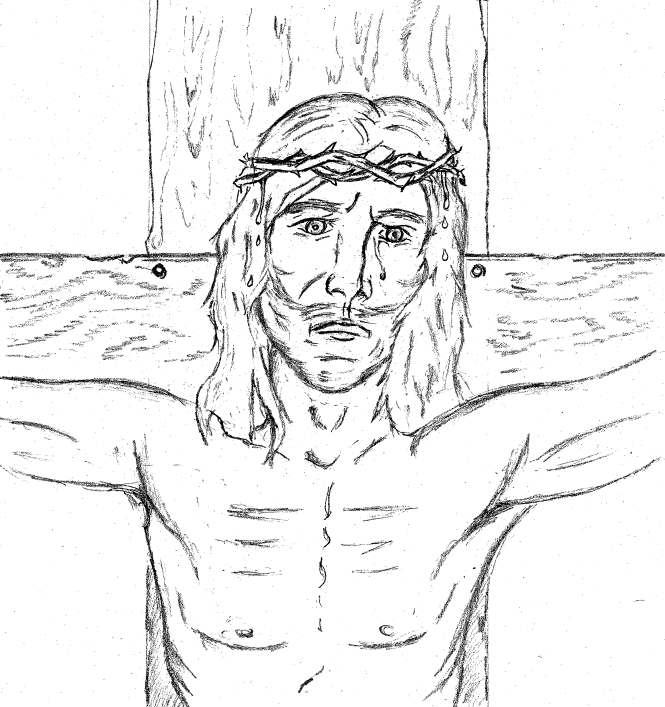 You will see him standing alone before all, stripped of his garments, whipped, beaten, and carrying the heavy cross onto his shoulders. You will see him dying on the cross with his mother, Blessed Mary, at his feet with her own pierced heart. May you look at the remarkable stained glass windows that shows strength and courage of the lives of the saints. May we keep stronghold our beliefs and teachings of Christ. May we look upon our churches with great awe and splendor wrapped up in many GIFTS OF GOD. It's the sound of beauty, reminding us all of God's "LIGHT" through all darkness shines forth, beaming among us all. The bells ring and it reminds us that church is beginning, and in Christ’s Mystical Body we are one in unity with him. I see children waking up in the morning, and they also can hear the church bells ringing. They are sometimes in wonder the bells. They eat their breakfast, and comfortably sit and watch TV or play video games. THE BELLS RING! Oh People! It's God's way to awake us, remind us of how much he loves us, he longs to see us return to him in his temples. He is looking for you and your children, in wanting to see you! Dear reader, children learn obedience and divinity. He or she sees what the church has to offer and all its beauty in song. Furthermore they know Jesus, in hearing "THE BELLS RING". 1st Station: (Jesus Condemned To Death) O Jesus! so meek and uncomplaining, teach me resignation in trials. 2nd Station: (Jesus Carries His Cross ) My Jesus, this cross should be mine, not thine, my sins crucified thee. 3rd Station: (Our Lord Falls The First Time) O Jesus! by this first fall, never let me fall into mortal sin. 4th Station: (Jesus Meets His Mother) O Jesus! may no human tie, however dear, keep me from following the road of the Cross. 5th Station: (Simon The Cyrenian Helps Jesus Carry His Cross) Simon unwillingly assisted the, may I with patience suffer all for thee. 6th Station: (Veronica Wipes The Face Of Jesus) O Jesus! Thou didst imprint thy sacred features upon Veronica's veil, stamp them also indelibly upon my heart. 7th Station: (Jesus Falls a Second Time) By thy second fall, preserve me, dear lord, from relapse into sin. 8th Station: (Jesus Consoles The Women Of Jerusalem) My greatest consolation would be to hear thee say, "many sins are forgiven thee, because thou hast loved much." 9th Station: 9t(Third Fall Of Jesus) O Jesus! when weary upon life's long journey, be thou my strength and my perseverance. 10th Station:( Jesus Stripped Of His Garments) My soul has been robbed of its robe of innocence, clothe me, dear Jesus, with the garb of penance and contrition. 11th Station: (Jesus Nailed To The Cross) Thou didst forgive thy enemies: My God, teach me to forgive injuries and FORGET them. 12th Station: (Jesus Dies On The Cross) Thou art dying, my Jesus, but Thy Sacred Heart still throbs with love for thy sinful children. 13th Station: (Jesus Taken Down From The Cross) Receive me into thy arms, O Sorrowful Mother, and obtain for me perfect contrition for my sins. 14th Station: (Jesus Laid In The Tomb) When I receive thee into my heart in Holy Communion, O Jesus, make it a fit abiding place for thy adorable Body. Amen. 2 Thessalonians 2 ch2: (verse 15) Therefore, brothers, stand firm. Hold fast to the traditions you received from us, either by our word or by letter. You close your bedroom door, tears are flowing down upon your precious face, you feel the softness of your pillow, and your mind is racing in many directions. You are thinking, "how can I find peace, and comfort be given?" You close your eyes, and drift into sleep. You see a man of great beauty and strength. He motions to you with a wave of his hand to climb aboard with him into his boat. You can see in the distance that a storm is near and you're afraid. The man continues to invite you, and the storm is getting closer. The winds are so strong and the sky is darkening. You finally arrive at the boat standing near the man. You fall on the soft sand beneath you, and see the man's feet in his sandals. Suddenly you can feel his cloak brushing against your face. He reaches down and pulls you off the ground. The storm is still on the rise, however he calls out to you, "TRUST IN ME." You climb aboard into the unsteady and rocky boat. The man places you in a secure seating in the boat and you're afraid. He continues to say, "TRUST IN ME." The waves are getting stronger, and you cry out "Jesus, help me, I'm afraid!" The man holds you ever so tightly, you feel comfort, and peace. The waves begin to calm down, and the storm is softening. You look up at the man who is still holding onto you, His eyes are full of love and warmth. He consoles you and tells you, "I love you, you are a beautiful person, and your TRUST IN ME is what saved you! You felt alone, afraid, and you cried out to me." I smile up to him with amazement, looking into his striking eyes of beauty,and replied, "You are Jesus!" The man of strength answers me "Yes, I AM, I motioned for you to come towards me and you responded. You entered into an unsteady boat on harsh waves, and you continued to REMAIN WITH ME. The storm was getting stronger and you cried out to me, and I responded back to you. Remember always, when the sound of the waves arise and continue to get higher, go to me on the Cross, and Kiss Me. I will remind you of your strength, courage, and placing your TRUST IN ME. I will wipe away your tears, and whisper into your ear, ‘I love you, and you are beautiful’". Jesus blesses me with making a cross on my forehead. I awake peacefully from my dream, I feel my hair being gently pulled away off my face, my cheeks are covered with my tears. I feel a gentle kiss onto my forehead, from someone who cares about me, and they whisper into my ear,"I'm sorry for your sadness, I love you, and you are beautiful." I glance up at my crucifix hanging on the wall and I remember what Jesus told me in my given dream, "When the sound of waves arise TRUST IN ME, I will draw you near me, I will console you, and give you strength. I will whisper into your ear and tell you , ‘I love you, and you are beautiful.’" Then I made the sign of the cross on my forehead and asked for God to bless me. He always responds. When I look at the crucifix, it's a reminder of how much Jesus loves me, THERE IS NO GREATER LOVE. Dear one, holding a crucifix or a picture of Jesus is placing your pain, sorrow, anxieties, fears, and giving it all to God, for he is the only one who can receive it. When you kiss him, it shows your love given, your oneness with him, and your heart joined with Jesus’ SACRED HEART. In doing The Embrace The Cross prayer method, it's as though Blessed Mary is placing rose petals from Heaven around you, to fall back on, and she lifts you up to EMBRACE HER SON, JESUS! God Bless You Always. My child has been sick for days and lying in bed. I've been praying daily over my child in asking for God's healing and his blessing. I often stay awake at night in my child's room to keep watch. Days have passed. I'm growing tired, and my child remains sick. My child has been given medicine to help the pain and possibly improve the condition of the illness. I keep on praying at my child's bedside, reading scripture, praying on my rosary, and praying in my prayer book. Every evening I ask for a special blessing from our Lord and drift into sleep in my chair next to my child’s bed. My child, awakes one morning with peace and comfort is written on my child's face, "Thank you for the glowing light; it made me feel warm inside." I wondered what that meant, for no candle is lit in the room at night. The next evening my child goes to sleep, only this time I brought in the room a beautiful night light of Blessed Mary holding baby Jesus, and placed it on the night stand next to my child's bed. My child awakes with peace and comfort, "Thank you for blessing me with placing the cross onto my forehead. I will always remember you for doing so." I was wondering to myself, if a dream was given to my child? That evening, I turned the beautiful night light on, prayed my prayers to our God, and went over to my child, and placed a cross onto my child's forehead. I went back to my chair, and drifted into sleep. God gave me a wonderful dream. I am asleep in my chair and holding my bible, my rosary still wrapped in my hand. I awake with a soft glow upon my face, and I can see an Angel, standing beside my child's bed, and holding a candle. The Angel's head is bent down in prayer, and kisses my child on the head. The Angel places the sign of the cross onto my child's forehead with a blessing and then leaves. I awake from my given dream. I go over to my child, remembering the night light gives warmth to my child, and reminds us of God's light. I go over to my child's bedside and place my given kiss onto my child's head, and a cross onto it's forehead. I ask God to bless my child in a special way. I then place a cross onto my own forehead as well, in kissing my thumb to represent Jesus on the cross. I go back to my chair, pick up my rosary and place my bible next to me. There is peace and comfort written on my child's face, and mine as well. Bless us, oh Lord, and I thank you. Embrace the Cross is for ourselves, our precious loved ones, and for anyone in need. It's placing our offerings to God and joining our ever so needs at his feet. We ask for His light and his divinity to be among us. We bring forth our offerings for those we love, even those who has passed away, and we give it all to God. It's simple and shows action in a soft and unique way to our loving God. Remember you can make a cross onto your forehead or chest, and kiss your thumb to represent Jesus on the cross. He blesses us and will always remember us for doing so. Remember always, if you or your loved one is sick, depressed, scarred of something from the past and in need of special healing of God, contact a priest to receive the sacrament of Anointing of the Sick, or preacher for Blessings of God. I dread saying good-bye to you today. I'm only going to be gone for a few weeks, and when I come back home I'll take you out for a nice dinner, just the two of us. My wife’s head was bent down and in sadness. The children were running around and playing as usual. My child who is ten years old hands me our family picture and says, "Dad, take this with you to remind you of us.” I gave him a hug and thanked him. I placed our family picture in my suitcase, hugged my family good-bye , and drove away. I arrived at my hotel, unpacked my things, and there was my family picture, gently placed between my clothes. I place my family’s picture near my alarm clock, and begin my day at work. Later that day when I arrive back at the hotel, I call my wife to see how things are. She says things are going well there, however she misses me. I reminded her of Embrace The Cross, and she answered me, "Yes, I will remember to do it this evening". I ate my supper in the hotel, watched some television, and turned out the lights to go to sleep. I remembered I had forgotten to do Embrace the Cross for my wife. I decided to do the "Short Way of Embrace The Cross" for my wife and family. I prayed the "Divine Mercy prayer " and "Prayer to The Heavenly Court". I made the sign of the cross five times on my forehead, reflecting on the five wounds of Jesus, and kissed my thumb representing the crucifix. I reached over to my precious family picture with a kiss, asked God to protect and bless us. In the morning when I find my rosary, I will kiss the crucifix to begin my new day. Meanwhile, at my home, my wife was doing Embrace The Cross as well. She was standing before our crucifix hanging on our bedroom wall, and she prayed the "Divine Mercy Prayer" and " Prayer to the Heavenly Court". She made the sign of the cross five times, and placed her given kiss onto the crucifix and our family’s picture in asking for God to bless us, and the night light was turned on as well. We were both given peace of God, before we went to sleep. Embrace the Cross can be done anywhere and at any time. It's simple and yet a powerful way of prayer. God adores those who "UNITE TOGETHER" in prayer, and spiritually together as well, such as the man leaving his family for work. Many people are separated due to the military. What wonderful way to spiritually unite together in God and ask for his Blessings. In some circumstances people are separated due to jail or prison. What better way to show your love in asking for God's mercy and protection. Embrace the Cross isn't only for ourselves to be able to do; give it to the person in the military or away on a business trip or entering into the hospital due to an illness, college, prison etc. May we teach those in need how to do the Embrace the Cross prayer method and according to one's condition, they may simply kiss the cross or crucifix, and that will be their prayer. Some may be sick, depressed, injured, broken, weakened. Often those people are in our own families. May we ourselves pray with them by doing the Embrace the Cross for them, and they will be uplifted with God's continued blessings. Our Lord said, "Where two or more is gathered, so I shall be.” God is always with us when we pray alone, however praying together is given even more blessings and strength from God himself. If you know someone who is in need of Embrace the Cross prayer method then you may wish to give it to them, for we are all brothers and sisters in Christ, Jesus, and he loves us all. Jesus said, "I can count each hair on your head, I have carved you in the palms of my hands, I have prepared a place for each of you in my kingdom." Note: If you are in a situation where you don't have a picture of the ones you want prayed for during the Embrace the Cross prayer method, mention their names to God, and continue the prayer exercise given. If you have no night light, remember God's light is in your heart! Any type of night light will do, including lights with batteries etc. a built-in light of a cabinet will be fine as well. Any Christian light will be great to have during the prayer exercise. Those of you who are having great difficulties and sadness, simply kiss your cross, crucifix, a picture of Jesus, and a loved one if desired, and place it near your bedside or underneath your pillow, and that will be your prayer. In reaching for your rosary or crucifix, this will uplift you and remind you of Jesus’ love for you. Always remember to kiss it in the evening and mornings. If you have a small crucifix or picture of Jesus, hang it above a light switch to remind you of God. His Light is given to those who love and adore him. GOD IS WITH YOU! When you comforted the sick, and depressed: You comforted me. When you held an elderly, handicap, lonely person: You held me. When you worked with the mentally challenged, and allowed them to see joy: You worked with me. When you consoled or counselled someone in need: You consoled me. You gave me a hug with your love. When you stopped and smiled at someone who was in stress: You smiled towards me. When people were using my name in vain, and as a slang word, and you pointed it out: You did it for me. When someone was being bullied, beaten and tormented, and you arose in their defense: You defended me. When a person was financially struggling, and you helped them: I blessed you, and would never forget you. When you gave others your discarded clothes and items, you clothed me and helped me greatly. When television had immoral, depraved, or evil viewing against me, and you changed it, and even cancelled it: You stood up for me. When you were cooking and cleaning for your family: You did it for me. When you stopped and focused on your family’s needs, concerned for their physical, emotional, and spiritual needs: I was with you. When you taught your children how to speak towards one another and towards you, and and how you spoke towards them and others, especially your spouse: I could see you. When you cared for your child's emotional stress or sadness with loving response: You responded to me. When you took the time daily to pray for your family: I listened to you and gave you my blessings. When you took the time to teach your children how to pray and learn scripture, my words: My light entered into your home. When you took your children and others in need to church: The Heavenly Court sang and danced! When you showed other that you loved Me and loved like Me: I remembered you imitated me, even in your difficulties and trials. When you placed my cross, crucifix, and my picture in your home for you to be reminded of Me: Many graces were given. When you enter into my Kingdom: I will say, with a smile "Thank you, for Embracing Me." "Whatsoever you do to the least of my brother, that you do unto Me." "My light will shine in ALL who desires to please Me, I will always REMAIN in your hearts, and your homes." Be aware , and be watchful, now more than ever! Look, and see what programs are filtering inside your own home. You ask for my protection, and I'm giving you warning. Acts so offensive upon Me are creeping in many programs. Teens, and yourselves are watching videos that keep placing thorns in my head, furthermore, even the younger children are viewing these types of programs as well. Observe the types of videos being placed before your children, and you will be disturbed. Take action and show interest in what your children are watching. May you take extra measures to block the program completely. Be wise and choose carefully of the music you surround yourselves of. Choose positive music, allowing it to be uplifting, for your family to hear. Remember always, Satan stands back, lurking in the shadows, ready to receive you, in all his depressed music and atmosphere. Listen to "The Coffee House" or "The Bridge", uplifting for the most part, on Sirius radio or TV, or any other positive programs. Listen to Christian music, for your children will learn and know the goodness of God! I AM YOUR LORD, YOUR GOD, and I want MY LIGHT to be in you, around you, at all times. I made you, I LOVE YOU, and you were made in the likeness and MY IMAGE. Keep strong, and remain with me, for my Heart is joined with yours ALWAYS! For those who feel the need to give Embrace the Cross to someone in need, maybe that someone lost a child or in womb. First of all, you need to pray about it, and remain faithful to Jesus. Try to learn the Embrace the Cross prayer method and the two given prayers of "Divine Mercy Prayer” and “Prayer to the Heavenly Court." Ask the power of the Holy Spirit of God to help you in guidance and to move forward in the will of God. Have the Embrace the Cross prepared to give out by writing or by speaking to them. You may wish to give them a sacramental item, such as a cross, crucifix, picture of Jesus, or night light, however it's not necessary. You may wish to bless your item with holy water or even better, by a priest. For someone who has committed an abortion, Embrace the Cross of Jesus, for he will be at your side of forgiveness. "DO NOT BE AFRAID", "KNOCK AND THE DOOR SHALL BE OPENED." Jesus’ own words. Try your best to learn the prayer method provided, ask God for courage, and make an appointment to speak with a priest, deacon, or minister. Have a small crucifix or rosary with you, and hold it in your hand as you speak. They will receive you with the kindness of Jesus and help direct you in your needs of God. May you ask your guardian angel for help and to pray for you. Remember always, Jesus loves you more than you will ever know. TRUST IN HIM! Blessed Mary will walk beside you every step of the way. She will place rose petals around you to keep you smelling the fragrance, and feel the softness of Jesus, your heavenly Father. May our Lord Bless you and keep you always. "Did God make this fish?" "Yes, he certainly did. Without God we can have nothing. He created the air we breathe, the land we walk on, and the water we drink. We should thank God daily for all the gifts he gives to us." My son asked me if Jesus is God and I answered him in saying, "Yes, Jesus is our Lord, our God, and his holy spirit lives in us when we were baptized." I further explained to him that the Father, Son, and Holy Spirit are all one in the same, and it's called the Holy Trinity. “Is it like the Christmas present you mentioned earlier?" my son replied. I answered, "Yes, in a way, because when we go to heaven, we will see, and know God, the son, and the holy spirit, Furthermore, they will remain with us and in us for all eternity. My son eagerly asked, "Dad, how do we get to know Jesus and what he taught to others?" “Well,” I answered, "The best way is to keep going to church and listen to his words taken from the bible. We are to keep learning why we have our holidays, especially Christmas and Easter. We are to keep learning how to pray and worship Jesus, our heavenly God. Remember son, everything we need on earth are gifts given to us by God so that we can live, including the spiritual gifts from God such as your baptism. First Holy Communion and Confirmation are sacraments you will receive when you're older. All the sacraments are gifts from God, for our Body and our Soul. The church has many gifts to offer us to help us here on Earth to reach Jesus and become One with him." "My dear son, that is why we go to Church every Sunday. It helps keep us close to God, where he wants us to be, and it's my job to help get you there. We give thanks to God for allowing us to fish today and enjoy all his creation." For those wanting to go to a priest for reconciliation or confession,"BE NOT AFRAID"
Christ said, "SEEK AND YOU SHALL FIND." "KNOCK AND THE DOOR SHALL BE OPENED." Simply call a catholic church for the times, or make an appointment. If you need to bring along someone for support then you may do so, however, they will have to remain in the pew. If you desire to receive baptism, simply call the church or speak with a priest after Mass, and they will be happy to lead you the way. My God, I am sorry for my sins with all my heart. In choosing to do wrong and failing to do good. I have sinned against You whom I should love above all things. I firmly intend, with your help, to do penance, to sin no more, and to avoid whatever leads me to sin. Our Savior, Jesus Christ, suffered and died for us. In his name, my God, have mercy. The priest will absolve your sins, John ch: 20, verses 19-25. To all parents, try to teach this prayer of act of contrition to your children, and say it often. Behold the handmaid of the Lord. Be it done unto me according to thy word. And the word was made flesh. And dwelt among us. When it comes to God and going to Mass or church, we as a people may often say, “I don't FEEL like going or I don't get much out of IT.” First, we must remember always that Jesus isn't a FEELING, nor an IT. Jesus is a person, our God and our Savior. In other words, we are really saying, “I don't (FEEL) like receiving Jesus and what he has to offer me, and I don't get much out of (IT) what Jesus has for me. If we as a people really focus on Jesus at Mass or our churches, those words FEEL and IT will never enter our minds, nor how we speak about Him. If our children see us responding in the FEEL and IT manner, they may look at going to church as a must “FEEL good” type of a place to go, or “what am I going to get out of IT” type of attitude towards Keeping the Sabbath Day Holy. The building itself and all the beauty within it is to be held with great value, and it helps us to be holy, uplifts us, and keeps us devout. However, the REALNESS is Jesus himself as he is the main focus. He wants to personally bless us each and every time. He sees ALL who are there: the sorrowful, the injured, the broken, the weak, and the strong. He wants to see ALL our precious faces, the young and the old of all ages. He is delighted greatly and he blesses us every time. May we remind ourselves this each time we go to church. We as a People are taking our precious time out to go and SEE JESUS! It's not about how I feel or what the church does for me, rather, it's about our offerings to God and our prayers while worshipping to Him. We do this so he may give to us those things we desire from him. May our Lord Keep you and Bless you all the days of your life. For those who are unable to attend Mass or church in your state of life or situation, may you view it on TV if one is available. Keep sacramental gifts around your home such as a picture of Jesus, Blessed Mary, Angels and Saints, crucifixes, items to remind you and others of our loving God. You may want to order an inexpensive prayer book called "Pieta Prayerbook". It's Blessed Mary holding her son, Jesus, as he is taken down from the cross. You can order it in the "Leaflet Missal catalog" at 1-800-328-9582, or www.leafletonline.com. They also have many prayers and the Short way of the Cross. It would be wonderful to take this book to church for a quiet time between you and Jesus! It would be great to keep it near your bedside, hospital stay, etc. You will be greatly Blessed by Jesus himself. Jesus! Jesus! Jesus! There's something about that name! Savior, we adore, Jesus, there's something about that name. When we Embrace you, you're always reaching, you're always reaching for us to. We love you, yes we love you, Jesus, Oh Jesus, Oh Jesus , Jesus, Oh Jesus! For those of you who have placed in your hearts Embrace the Cross and Army of Prayer and Rosary, may these inspirational writings that Jesus gave to me, and for me to give to others, help keep our focus on Jesus and help us enter into His Heavenly banquet. May we, as a people from every church of God, be that constant beam of light pouring out God's graces among us ALL! May we all pray for everyone who EMBRACE THE CROSS of our Lord. God Bless Always. The first need is called our BASIC NEED: Food and drink. The second need is called our EMOTIONAL NEED: love given to us. The third need is called our SPIRITUAL NEED: giving God to others, His spiritual gifts of love. We must give people their basic needs and help them with their emotional needs before we can give the spiritual needs to them. Remember the popular Miracle of God, St.Matthew Ch:14 verses 13-21 (The five loaves, and two fish). Jesus fed the crowd by the thousands! Jesus took the loaves and fish, looked up to Heaven, and blessed it with thanks to God. Then he broke the bread and gave it to his disciples along with the fish and spread it around abundantly! There was so much bread and fish feeding so many people. That was a basic need for God's people, and a spiritual need was given through this miracle. Jesus showed his power to his disciples, preparing them for his miracle yet to come, the breaking of the bread. The loaves and fish foreshadowed The Last Supper (John ch: 6). Jesus, looking up to Heaven, took the bread and broke it, raised it up to Heaven, and blessed it with thanks to God. He changed bread into his body and wine into his blood so that they may be given to his twelve disciples. In turn, these were to be given to his people! He said, "This is an eternal covenant for forgiveness of sins, do this in memory of me!" How many of us are willing to stand by Jesus, at his table, at his banquet? Will we become like many of his disciples, quarreling among themselves, saying, "How can he give us his flesh to eat?" John ch:6 verse 52-59. Jesus asked the twelve, "Do you want to leave me too?" Peter responded, "Lord, to whom shall we go?" John ch.6 verse 67-70. We as a people unite together in this glorious feast at every Mass, even in our brokenness, sufferings, and pain. We say, “I’m here Lord, I will remain in you, and you in me, now and forever!” Those who cannot receive Christ physically, but only spiritually, you are in union with him at his heavenly table. Whatever your situation may be, you are choosing to remain in him and he in you! God blesses all who believes! The twelve disciples, through the power of God's Holy Spirit, was given to them by Jesus to be able to change the substance of bread and wine into the miracle of the Holy Eucharist. This is Jesus, body and his blood, and it is to be given to all people abundantly. Jesus gave this to us for our physical and spiritual needs when receiving his true body and blood, for all who believes in him. Jesus would die on the cross, (on Good Friday) pouring out his precious blood for all the world. The Holy Eucharist reminds us of Jesus’ sacrifice he gave to us on Calvary. We become one with him through our baptism when receiving him humbly and devoutly in this beautiful spiritual food and drink. That is Christ, the everlasting heavenly banquet. When we receive the Holy Eucharist or communion, we say AMEN meaning: I BELIEVE. Before we receive Christ’s body and blood, we make the sign of the cross after we receive, meaning: Father, son, and holy spirit. Those who wish and desire to receive Christ in this beautiful and wonderful holy sacrament that Christ instituted and gave to the world, simply contact a nearest Catholic Church or speak to a priest after mass, and they will be helpful in pointing the way towards JESUS! THERE IS NO GREATER LOVE! For those who cannot receive the Holy Eucharist, for whatever reason, you may say the spiritual communion prayer and Christ’s blessings will pour over you. Pray this prayer during Mass or when watching Mass on TV (EWTN Christian Catholic Channel). O Jesus, I turn toward the holy tabernacle where you live hidden, for love of me. I love you, O my God. I cannot receive you in Holy Communion. Come nevertheless and visit me with Your grace. Come spiritually into my heart. Purify it. Sanctify it. Render it like unto your own. Amen. Lord, I am not worthy that thou should enter under my roof, but only say the word and my soul shall be healed. I see you sitting alone, and you're confused. You're feeling as if no one knows what you are going through. I'm standing beside you, and a soft glow is beaming from my cloak all around me, for I am Holy. I see your head looking downward. I draw myself close to you, and my pierced hands are both beside your beautiful, framed face whom I created. Tears are streaming down your precious face, and my pierced hands catch your tears. You continue to cry, and I never leave you. I know your distress, and I keep on catching your tear drops onto my pierced hands. Suddenly you see my Image, me being crucified, and your tears keep flowing . You see my own tears streaming from my Holy face. Your eyes meet my eyes. You see my crown of thorns and my precious blood pouring down my beautiful face to be shed for the world. I did this for You! You embrace my feet on my Holy cross, and my feet are on fire! You see my eyes are in so much pain, and my head is moving from side to side. My whole being is casting down upon you. Your precious tears wipe my feet with your face, and I will remember you. You make the sign of the cross onto your forehead and kiss my crucified Image. Your heart joins my sacred heart. My child, you reflected on my own suffering on the cross, my agony, crown of thorns, pierced hands, and feet. The soldiers pierced my side. My holiness of my blood and water spilling out into the world for EVERYONE! Those who look at me with purity of heart, I will lift you up towards me. My desire is that you will REMAIN with me, at every moment of day and night. I will REMAIN at your side when you feel lonely, lost, and empty. You will feel my gentle, pierced hands placed underneath your framed face of beauty, catching your tears. If you wish to place a crucifix, Divine Mercy picture or plaque, the sacred heart of Jesus etc. in your home, contact Leaflet Missal Catalog at 1-800-328-9582 or www.leafletonline.com. While you are waiting for your gift of purchase of Jesus to arrive simply find his picture on the internet and give your given kiss onto the screen, and make your sign of the cross. Try to do the Embrace the Cross prayer method or the Shortway of the Embrace the Cross, and many gifts will be given by God. Blessings Always! This is what I believe Jesus is saying to ALL OF US. My dear ones, I am your God, your Lord, Jesus. I made you in my own likeness, and my Image. I knew you before you were even born. I made only one of you, and your name is written in the palm of my hand. When you were an infant I watched you being cared for, and love was given. I could see you learn how to walk, play, color, draw, and interact with others. I've seen you run around and have fun! I appointed your Guardian Angel to keep watch over you always. Now that you're growing older, I'm seeing your personality form, and you becoming more independent. Every day I see you trying to become responsible and develop skills that will help you perform tasks on your own. Please, my Dear One, take me with you everywhere you go, for I want to be with you always. My HEART BURNS for you, and I DESIRE YOU. Remember, I'm your Heavenly Father and I want to be your STEERING WHEEL, not your spare tire. When you are quiet and alone, can you reflect on me and look at Me? Can you close your eyes for a moment and think of me, and WHO I AM? You know that I made you. I've watched you grow and I've seen your ups and downs. Please, believe me that I still know you, now more than ever. I want you to see my beam of LIGHT shining down upon you. I want you to feel my presence all around you, in your place of silence. Will you look up towards me so I can see your beautiful eyes, the ones I made? Can you Embrace me on the cross so I can cast my eyes down onto yours? Can you kiss me on my cross? I want to help you carry your cross, make it lighter and lighter each day. When you reach up to me I will always reach for you as well. Do you really see me? Can you really feel me? When you do Embrace the Cross prayer method or the Short way of Embrace the cross, the more graces and blessings I will give to you. Keep positive always and REMAIN with me. Remember always, I have nothing in common with DARKNESS. KEEP AWAY FROM THE WORKS OF SATAN AND ALL THE EMPTINESS HE OFFERS. I'm the ONLY ONE who knows you, more than anyone. I made you so you can love me and be with me in my KINGDOM. Try your best to reflect on my photo, a crucifix, My sacred heart photo -- anything that is of me -- for I will be yours and no one shall take you away from ME. Join your precious heart into my SACRED HEART. I love you, my precious one. Keep on learning about me, wanting to know me MORE and MORE! TO ALL PARENTS: SLOW DOWN! Spend TIME with your children. Look into their eyes and SEE ME. Show them your love and kindness. Ask me for patience and I will give it to you. Most of all, kiss them often on top of their head, with a gentle hug. Those actions speak for themselves, saying I Love You. May you pray your Guardian Angel Prayer every night. Have you ever bumped or hit the top of your foot and noticed how much it hurts? The next time it happens think of Jesus’ pierced feet, hanging on the cross for three hours long. My dear ones, never be ashamed of holding a crucifix and kissing it. Jesus will acknowledge your sincere action, and He will keep you strong. Never be ashamed in Making the Sign of the cross, on your forehead or chest (the letter T). It's Jesus, the CROSS, and his cross of redemption was for ALL OF US. Love making the cross onto your body, for it is FULL ARMOR of Jesus. It means “In the name of the Father, and the Son, and the Holy Spirit.” Try to say this when making your sign of the cross. When you kiss Jesus on the cross and show reverence, we are not re-crucifying him. He already paid the ultimate price and won victory for ALL! Please help give this website to other. It can help uplift so many people in our loving world and help us all to see God's Light! EMBRACE THE CROSS. To ALL people of drinking age: Too much alcohol is AGAINST GOD. Ephesians ch. 5 verse 18 states to NOT GET DRUNK, and verses 15-21 points to our own CONDUCT over ourselves and others. We are to drink alcohol RESPONSIBLY in MODERATION (lightly) and have other drinks available such as water or soda, so that one won't be tempted into eccessive drinking. Set a good EXAMPLE for others and those around you, especially our children, for they are WATCHING and LEARNING from us. Our Lord sees us as well! Ephesians ch. 5 is relevant and pertains to OUR TIMES. Look at the media for the destruction alcohol can cause when it is abused. It can cause pain, forgetfulness, sin, lust, and even DEATH OF MANY. ALCOHOL and DRUGS can become SATAN'S playground, for it can cause bad actions, thoughts, carelessness to ourselves and even to the ones we love. The alcohol can remain SILENT and yet during the 15 Minute Program, it is the cause of so much DRAMA and REAL DEATH. The real professionals who work in our society are the ones picking up ALL THE PIECES from EXCESSIVE DRINKING and USING DRUGS. They are the ones picking OUR CHILDREN off the pavements or in our fields and placing them in BODY BAGS. Only there WON'T be a retreat at the end. There WON'T be a written letter from our child or loved one. There will be only pain and suffering. We MUST remain RESPONSIBLE and realize that when we are going AGAINST Ephesians Ch. 5, we are seperating ourselves from JESUS and those we LOVE. May these Every 15 Minutes Program videos and writings allow us to RETHINK before we make that CHOICE to DRINK and DRIVE, or have DRUGS in our system, and TEXT (YOU COULD BE NEXT) PLEASE protect yourselves and those around you! THINK and RETHINK AGAIN. WARNING! Although they are reenactments, these videos are graphic and contain blood. I believe we can learn a lot from them and help save others. The videos show great pain and sorrow, and may be too difficult for some to view. Respectfully yours, and God Bless! I went walking through the grassy fields and climbing hills. I wanted to find peace and quiet to myself. I began thinking of my life, its past and present forms. Suddenly I find myself in a swampy area, and my legs began sinking in mud. My body sinks half way down and clear up to my waist. I call out for help, but there is no one to be found. A bird flies over my head and lands on a tree close to where I was. If only I could reach the branches hanging, but I wasn't close enough. I began to panic, "Oh Jesus help me. Where are you?" To my amazement, I could see a soft white glow form in the sky; it was an Angel. The Angel was holding a lighted candle and pointed up towards Heaven. Suddenly I could see a man appear on the embankment looking down upon me. I could see He had a long white gown on, however, I couldn't see who he was. It was foggy, and His face wasn't clear enough for me to see. I was hoping the man would pull me out of the mud. Instead, He raised his right arm out and pointed in the sky. He spoke to me and said, "This is your life." Suddenly I could see in the sky my life replaying right in front of me. It was as though I was watching an old-fashioned film, and everything was about me. I could see my birth, my own baptism, my childhood, and my First Holy Communion. Each wonderful event had a bright light shining over it, however, as I was growing older in time, I noticed some of the film being darkened, and I couldn't make out what they were about. I could see my wedding, and my own children's births, however I was still concerned of the dark spots in the film. I finally yelled out to the man, "What are the dark spots in my life?" The man turned sideways, and all I could see was his profile. Suddenly the man began to weep, and tears flowed down his face. The man pointed again to the sky, and I was able to see more events of my past and present life. I could see the darkened spots come to life. They were my sins I committed against God, and some of my actions I've done. They were the pain I caused upon others and even myself. As I continued to watch, light would attempt to beam forth through some important events that took place, however it simply couldn't shine. I could see all of the holidays in front of me, however fog would cover them. I yelled out to the man in saying "Even the Holidays? I love the Holidays!" The man answered softly, "I looked for you on my Birthday, Dec. 25th and you did not come." I looked up at the Angel that was holding the lighted candle, however the light of flame was gone. The man continued to speak, "I looked down upon my cross during lent for 40 days, and you were no where to be found." He continued to say, "The Heavens and Earth rejoiced on Easter Sunday, My Resurection for the World. However, you nor your famly were there. Sundays after Sundays pass by, and you never visit me." The mud beneath my feet began to sink into the ground even more. "OH My Lord! Forgive me, I never want to hurt you, and I love you. Please, Jesus, help Me!" Suddenly the candle the Angel was holding was brightly lit again. The fog was lifted from the man's face, and I could actually see that he was Jesus! He asked me, "Do you love Me?" I answered Him, "I love you, My God." He replied, "Kiss my Cross, and Tell others WHO I AM." Jesus handed me two sticks, saying, "I love you, and I love the whole world. I will never leave you." I looked up, and Jesus was gone. The Angel still remained in the sky with the glowing candle. She pointed to the two sticks that I was holding and left. I took the two given sticks that I was still holding in my hands and made them into a form of a cross. I picked up the cross with tears flowing from my face and kissed the cross of Jesus. Suddenly the mud all around me began to harden and crack. I managed to lift both my legs out of the cracked mud and climbed onto the grass. I finally made it back to my house, and my children met me at the door. They asked me where I had been and why I was holding two sticks! I went into the house, found some thin rope, and wrapped the two sticks together to make a cross. The children watched me hang the cross on our wall. I turned to my family and said, "Do you know the meaning of this Cross?" Remember Always to keep Holy the Lord's Day (The 3rd commandment of God) unless you are unable to get there (sickness, weather, etc.) Or, watch a Christian Service or EWTN Holy Mass on T.V. Pray the holy rosary, prayers from your prayer book, etc. Jesus wants to heal us in our physical, spiritual, and emotional well-being. He wants to softly cover us with His pure white linen cloth, to grant us comfort and peace of His own. If you are able attend Saturday evening Mass or Sunday services, then you will feel His presence, unity in Him, and His oneness. He is waiting for You and Your Loved Ones. God Bless You Always. note: Wisdom is a Tasting of God. We need one another to help reach the goal of Jesus. If you are unable to attend Christmas or Easter Mass, you may attend the vigil Mass on Christmas Eve or Saturday Vigil Mass. This applies for Easter as well. We must make an effort to want to be with our precious Lord, Jesus Christ. He will grant you His Blessings. Remember always, when we enter into church, dip our hands in holy water, and make the sign of cross, it reminds us of our baptism. I'm getting older in my life, and for the first time, I'm flying in a large airplane. I am above the clouds, and I can see tiny dots below. The dots were houses. I whisper to myself, "Oh! Blessed Mary, so this is what our Lord created! I am amazed, and enjoying God's marvelous world below. I'm still flying in the sky, but as time passes, it becomes darker. I'm flying above a large city, and I can see all the beautiful lights. The lights are shining from home to home. I thought to myself, "Wouldn't it be wonderful if every home had a special light lit only for God! His light will beam from home to home, and place to place." Suddenly, Jesus allowed me to see inside many homes. In some homes there are crosses or crucifixes being neatly placed, and they can be viewed from all who enter the home. I can see a parent turning on a nightlight near the crucifix. The parent, after making the home quiet, begins to pray. In another home I can see a mother laying out school clothes and preparing for the next day. She helps her children settle into bed. The parent or parents stand in the hallway with their children's doors open, waiting to begin prayer. The prayer echoes from room to room, and prayers are going up to Heaven. It's 10:00 p.m. and a parent decides to pray in silence. I can see him or her sitting alone on a chair, facing their crucifix. The parent does Embrace the Cross prayer method and quietly goes to bed. I can see in another home, a lighted China cabinet is turned on. I see special photos carefully placed within the cabinet alongside a statue of an Angel. The person opens the cabinet door in doing the prayer exercise of Embrace the Cross. She makes the sign of the cross and kisses the cross of Jesus. I can see in another home some people reading through scripture. They decide to do "The Shortway of Embrace the Cross" before going to bed. Oh! I can see all these people in prayer to Jesus! They are all in union together! I see another home of a woman who has a beautiful statue of Blessed Mary, holding baby Jesus. A rose is layed on the table next to the statue. The woman does Embrace the Cross prayer method. She receives strength from our Lord. She picks up a smaller crucifix and kisses it. She takes the crucifix to bed, places it near her, and she is comforted. Jesus! You have shown me examples of people in prayer. It's beautiful, my Lord! Then Jesus shows me a home where he is not found. There is no cross, nor crucifix, and no bible. Is there at least a prayer book inside this home, My Lord? He allows me to see inside the home. I search and I can't see anything of God. My heart is saddened for Jesus and the family who lives there. I continued to search for any sign of God. I could see a light coming from a bedroom, and a teenage boy was sitting at his computer. He was seeing the face of Jesus on a computer screen, and was looking at Embrace the Cross. He began making a cross onto his forehead. He reached towards the screen, placing a kiss from his fingers onto the face of Jesus. He turned off his computer and went to bed. Oh Jesus! This boy found You! The light is in his HEART, joining your SACRED HEART. He didn't have a nightlight, nor anyone praying with him. Yet, he found the light of Christ through Embrace the Cross. The light from His computer was his own night light, one that he can return to over and over. Dear ones, The Quilted Rosary can be found in many places of the world. The pieces of the quilt are our mobile devices, computers, cell phones, rosaries, pocket rosaries, and our precious fingers. The nightlights and lights from our computers are reminding us all that we are UNITED TOGETHER, through joy or pain. Together we are facing the Cross of Jesus and are joyfully responding back to him. He receives us all individually to himself with awesome. The list can go on and on. Some of you may want to go the extra mile, letting the schools, neighbors, workers, etc. know that you are praying for them. They will be grateful and appreciated. Remember always, prayer is our COMMUNICATION to God! If you sing to Jesus it's like praying twice to God. Dear teens, please view the Every 15 Minutes program and go to (Pleasant Hill School). It is a short video, and I believe you will like the music provided. Please show your friends, and VIEW this video often to REMIND YOU the TRUE RESULTS OF DRINKING AND DRIVING. Please remember Embrace the Cross is a Union of Prayer all across the WORLD. Remember those in your prayer who are embracing the Cross of Jesus, All who are in His Army of Prayer and Rosary, who are asking God and Blessed Mary, Mother of God, for help in our world. Remember the 5th of the Month, all Holidays, Birthdays, important dates, and all Fridays. WE ARE EMBRACING THE CROSS OF JESUS, TOGETHER! GOD BLESS OUR WORLD.